Serenity III is the only daughter of the reigning Queen of the Moon Kingdom, and is currently considered the heiress to the thrown. She's very much doted upon, but somehow she has managed to avoid becoming a spoiled brat. Her calm, sweet demeanor reflects how deeply she's taken to her mother's teachings. Technically, this is Usagi, the same girl who in a future life becomes the title character of the Sailor Moon series. Serena's mother was Queen Serenity II, the only child of the founder of the Silver Millennium. Her father was the greatest, most magically strong and wisest Venusian prince ever known: Giles, who was surnamed Tranquility once he married into the Royal Family. Their union, while not as hoped for among the people as a pure Lunar pairing might have been, was well accepted and applauded. After all, it's not like the Queen married one of those uncouth, savage Earthlings, is it? This mix of Lunar and Venusian bloodlines is a strong merger indeed. As she grows up and practices using magic or perhaps even Senshi powers, none will be able to stand against her. It's theorized that once she comes of age, she could conceivably wield the Ginzuishou at its maximum potential multiple times and still live to tell the tale. She may be a little slow on the uptake, but her potential is, for all intents and purposes, unlimited. It's a low-down, dirty shame, though, that she's expressed no interest in running around in a miniskirt like some of the other crown princesses her age, and nothing her mom says can change her mind. 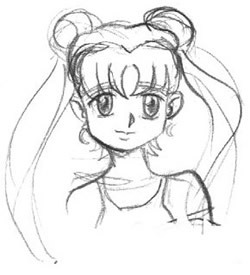 She looks a lot like her mother, a bit like her father, and exactly like her future self, Usagi Tsukino. She's not quite as pale as her mother, but she's still reasonably fair-skinned. Her father's genes took control of the hair department: she's a confirmed yellow-blonde, rather than a platinum blonde like her mother. All in all, it's like taking a younger Usagi and giving her lessons in decorum. or so she thought before she met Terra. Oh, certainly, she was initially thrilled by the prospect, but no amount of wishful thinking can change some of her newly-adopted sister's habits. Taught the principles of proper poise and the value of dinner etiquette, Serena is often caught off-guard by Terra's rather animalistic manner of eating. She'd met people she thought were a bit uncivilized, like that Terran king, but unlike Terra, even they ate their meat after it had been cookedor at least after it had stopped squirming. What's more, Terra always plays just a little too rough. Whenever the crown princess wants to play a regal version of "house", Serena always gets to be the "mommy", but Terra always insists on playing the "horrifically-destructive-xenomorphic-alien-from-beyond-the-blackness-of-space-who-has-come-for-your-soul". Clearly, the two children are eventually going to end up with philosophical differences of one kind or another. When the battle for attention from Mom heats up, things will really start to get nasty. 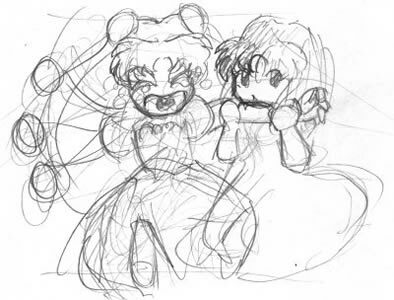 Princess Serenity will attempt to show off her refinement, and Terra sees her refinement and raise it three painful chomps to the arm. At this point, it's pretty much impossible to see how things will get resolved. We'll just have to find out, won't we?